The Metal Forge >> Review >> Megadeth - Peace Sells... But Who's Buying? Everyone is familiar with Dave Mustaine and how Megadeth came to be, so I’m not going to dwell on the subject. It seemed that for a long, long time, Mustaine felt that he was always walking in the shadows of that other metal band that shall remain nameless for this review. Whilst that is understandable, there’s no denying that Megadeth were just as significant during those formative years of thrash metal. Their second album, Peace Sells…But Who’s Buying? totalled eight tracks (seven classic Megadeth originals and one cover) of guitar fused madness and pissed off lyrics that feature no end of classic metal cuts that are definitive in the history of the band, and still as popular today live as they were back then. Wake Up Dead thunderously opens with a drum and bass roll intro and tells the tale of the repercussions of Mustaine sneaking home late at night and waking up his then partner, Diana. It’s still a crowd favourite when it’s played live nowadays almost 20 years on. The Conjuring continues nicely from where the opening track ended featuring more furiously double picked riffs and quality leads from both Mustaine and guitarist Chris Poland. The instantly recognisable bass line that drives the title track cranks along as Mustaine snarls about the general state of the world and its politics as they were back in the mid 80s. The thrash fest continues with Devils Island and its galloping feel created behind the verse. The dark sounding intro to Good Mourning/Black Friday sets the tone for the last half of the album as the lyrics tell the story of a homicidal maniac’s killing spree in quite colourful detail. The gloomy content continues with Bad Omen but the album overall is continuing to flow with a level of brilliance that competes with, and in some cases tops, the second albums released by other thrash bands of that era. The only stinker on here is their cover of Willie Dixon's I Ain’t Superstitious. Whilst it’s fun and thankfully short, I never felt that it fit back in the day when I first heard this album, and that opinion hasn’t changed during all those years since. Sure Megadeth have put their mark on this song, but it’s not quite enough to save it. Vanessa Williams sang something or other once about saving the best till last. 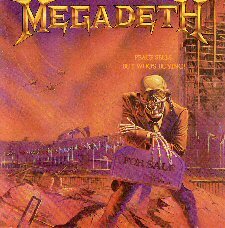 Megadeth subscribed to that philosophy long before it was made a Top 10 hit. My Last Words is an awesome way to end an album. It makes you forget about that other song on the album that really didn’t fit or something. Brutal, fast and aggressive. Bust out all the adjectives for this one because it deserves it. It’s an amazing way to end an equally amazing album for it’s time. But does it stand up to the test of time? Without a doubt, yes. It flows. It thrashes. It’s still full of timeless metal classics that garner a huge response when played live. Even with one song that does detract from the album a little, not too many marks are lost because it was never there’s to begin with. In fact, the rest of the album more than makes up for that one track. Peace Sells is absolutely essential to any metal head’s CD collection. If you don't own this, do not consider yourself a metal head.